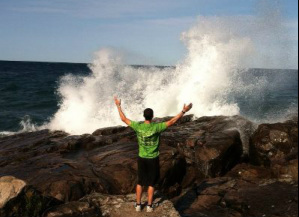 My name is Douglas Baker and I was born in and have lived in Marquette, MI for the entirety of my 25 years. I graduated from Northern Michigan University in 2011 with a bachelors degree in Exercise Science. I work at a personal training studio called Superior Fitness in Marquette as a Personal Trainer and Holistic Lifestyle Coach. I have been blessed with a fantastic group of coworkers with similar views on what it takes to achieve and live a healthy life. Another major blessing in my life (which continues to give/grow daily) is the massive support system of family, friends, clients, and acquaintances I have and am forever thankful for. The ability to connect with other like minded people who have a desire for personal growth in all aspects is another to add to the list. “This being human is a guest house. Every morning is a new arrival. A joy, a depression, a meanness, some momentary awareness comes as an unexpected visitor...Welcome and entertain them all. Treat each guest honorably. The dark thought, the shame, the malice, meet them at the door laughing, and invite them in. Be grateful for whoever comes, because each has been sent as a guide from beyond." "When I'm sad I stop being sad, and be awesome instead."